That being said, many of you are new here as well. And many of you have no clue about many of the things that have become very ‘basic’ for us here on the farm after all these years. When I first began the blog, many of these things were new. And now that they’re so engrained in our routine, it’s easy for me to skip over them and mistakenly assume that many of you know what I’m talking about. In an effort to close this gap and refocus on what is so important about the way that we eat and how that affects our lifestyle, I’m launching a short series of posts I lovingly refer to as ‘Back To Basics’. In these posts, I’ll be reposting some of my earlier posts – with new photos, resources, and material – to help bring back to life some of these long-ago-written-but-still-wonderfully-relevant tutorials. My prayer is that it will breathe new life into them. That it will revive the ‘why’ and ‘how’ of what we do and how we eat. This week, we’re going to refocus on kefir. Because for over four years, we’ve been enjoying this fermented goodie. I still have to thank my Mom for gettin’ me going on this “fermented” goody. It’s always something that I had wanted to try, but never got around to it. When my Mom showed up with enough kefir grains to go around, I jumped on the band wagon. Because. Why not?! Gut health is essential to overall health. And fermented goodies like kefir contribute crucial bacteria to our guts. Fermented foods = happy gut. Happy gut = happy body. Essentially, kefir is fermented milk. ‘Grains‘ are introduced to milk, which in turn ferment the milk and culture it to a rich, tart, liquid. Like kombucha, for some, the flavor takes some getting used to. It’s fermented, and therefore, has a slightly sharp flavor to it that many are not used to (as we typically steer-clear of this type of food). 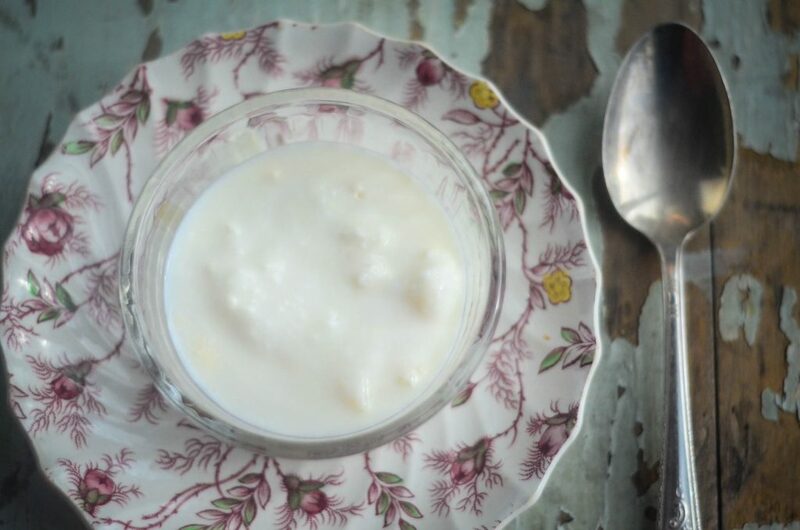 Think about kefir as yogurt on steroids. Millions and millions of beneficial bacteria, just swimmin’ around in that milk for your digestive pleasure. 1. Acquire kefir grains. There are separate grains for both milk kefir and water kefir (I only have experience with milk kefir, so that’s what I’m going to focus on here). These grains are a culture of bacteria and yeasts that break down the milk and make nutrients more accessible to our bodies. They look like rubber cement boogers (What? I couldn’t have been the only one that made those in elementary school?). 2. Fill a mason jar with milk. Add in the milk kefir grains. 3. Set the jar on the counter and leave it out at room temperature to culture for twenty-four hours. 4. At this point, the entire jar can be put into the refrigerator until you’re ready to drink the kefir. When you’re ready, simple dump the contents of the jar through a fine, mesh strainer. 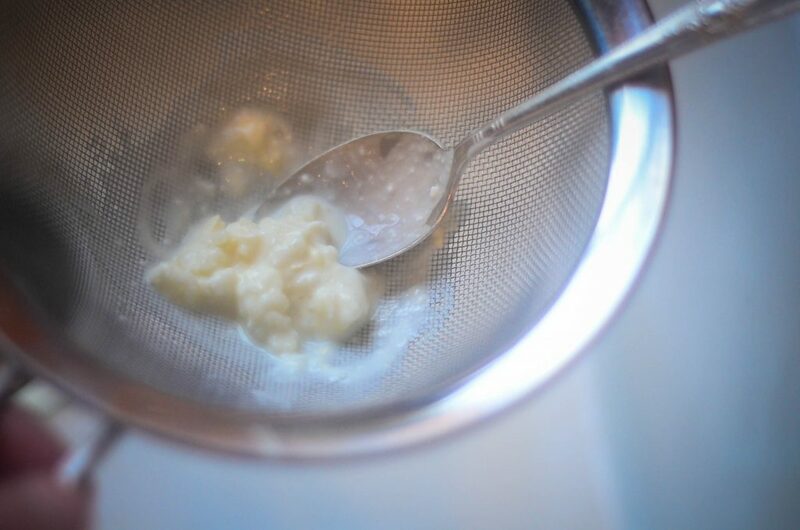 Use the back of a spoon to gently smoosh the cultured kefir through the strainer, while reserving the grains. 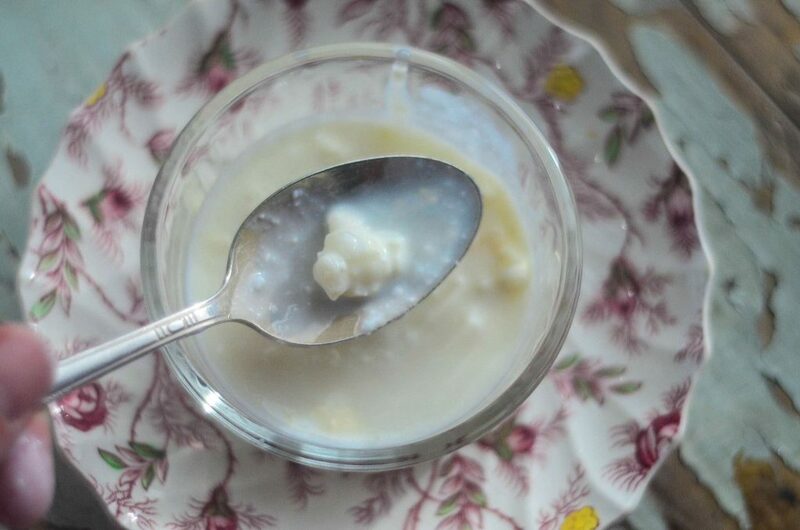 The liquid kefir can be utilized in a variety of ways; the grains will go into the next jar of milk for culturing! And so the cycle continues. – Use raw milk! 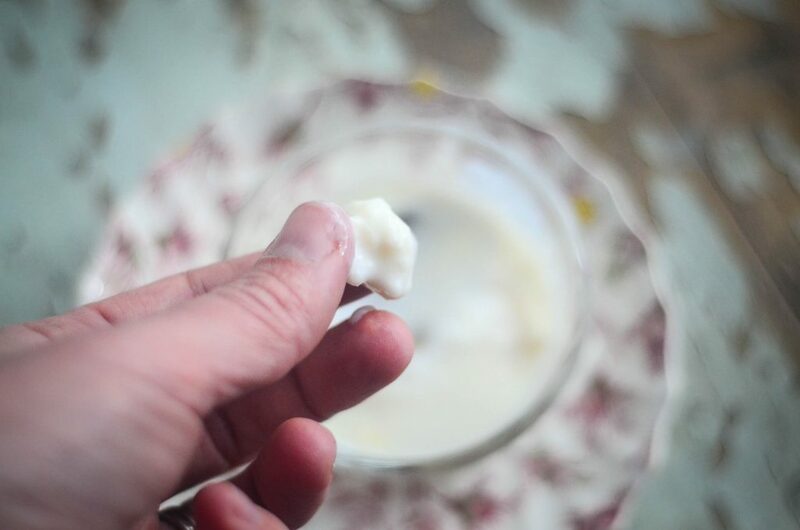 I’ve found that my kefir that has been cultured with raw milk is even better! – Use it often! The more often you strain your kefir and give your grains fresh milk to culture, the healthier your kefir grains will become! Remember – they’re alive! They need TLC. – Keep your grains in plain milk. While sweeteners or flavorings (such as fresh berries!) may be added to the kefir, make sure you only add it to the strained kefir liquid! The grains should only be in contact with the milk. – Play around with flavorings! Don’t give up on enjoying this fantastic food if you don’t like it at first! Keep trying different ways to enjoy it! (P.S. 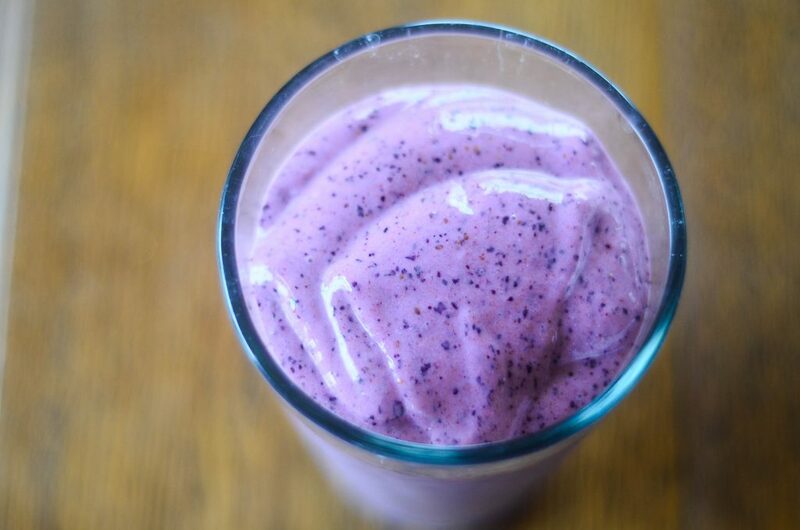 : My favorite kefir smoothie recipes are featured in my cookbook, From Scratch!). – As you continue to use your kefir, your grains will grow! You can easily share extras with friends. I try and always keep a tablespoon of grains for myself to culture 4 cups of milk with each time. I love kefir. I really do. And after 4 years with the same grains, it’s like an old friend that comes out to visit us for breakfast three times a week. Fermented foods are a simple, traditional, and easy step to take towards a healthier, whole food diet. Come on, you know you want in on this action. Alright alright, I’m sold! One question-how many “grains” am I putting in? It can range – 1 teaspoon to a few tablespoons! I tried to like kefir-I really did-but I just couldn’t do it. However, I love lactofermented veggies and eat them with abandon! (Lactofermented cabbage salsa verde being a new favorite!). And we do love yogurt, which I either make or snag some whole, grassfed variety at the store-maple hill creamery and white mountain are good ones, both culture for 24 hours, are deliciously tart, and are whole, grassfed milk. I wish I could be a farmstead mamma, but with the kids in private school the second income is a must -so I continue to make what I can, and source well for what I buy, and feel good about it. Thank goodness we live where I can buy raw, grassfed milk, ranged eggs, grassfed meats, local, organic produce, etc with ease! Have you tried it with Goat milk? How long did you play with it and were you getting a good product and just didn’t like the taste or effect. I made Kefir with milk when I first started. I was the only one drinking it. Now I make water Kefir and my husband loves it. We drink 1/2 gal./day. I’ve been meaning to start some milk kefir! One question, what do you do with them if you don’t want to make kefir for awhile? Just put them in fresh milk and pop them in the fridge (I use a ball jar and plastic lid). It’s best to give them fresh milk every couple of weeks. I had the same question! Where do your kefir grains live when you’re not actively using them? Buying or selling raw milk (for human consumption) is illegal here too. The loophole… You can buy or sell to feed to your animals. My dog sure loves raw milk. Your local farmer should be able to point you in the right direction. Some places allow you to buy shares or if you have a farmer willing to take care of your goat you bought from him, then drink YOUR milk. ALL YOU NEED, is access to ANY milk, as long as it’s low temp pasteurized – and specifically shop a grocer where it’s GRASSFED without additives like D… get GOAT if you can, look for farmers co-ops, closing the state lines… and a tip, if you can get FROZEN Goat, it stays fresh up to 6 months with loosing very very little of anything, taste is almost the same and nutrients too… so if you find anyone willing to ship it to you frozen, give it a whirl – and some places will give you grains if you buy their milk. Big kefir fans over here as well! We also use raw milk and love all the health benefits. One question though… I was under the impression that any contact with metal (spoons, strainers, etc.) will ill your grains. You might want to check into that! We only use wood and plastic with ours and have had great success. I’ve never had that problem? I’m not sure! I’ve got my kefir grains just today and I’m so excited! It was a givaway from the university and you had to attend an information conference. They sayd you should avoid metals on kefir, but stailess steal does not hurt it that bad. I’ve bought a super cheap plastic collander just in case. They gave us some kefired milk to try, one with vanilla and other with banana. I love both and can’t wait to put some of my berries in it! I would love to try some Kefir. Where do you get the grains? Thank you. Health food stores (or Amazon) have them! I’m new to your blog and love it. Thanks so much for this information. I plan on giving it a try. We’re making kefir too: milk and water. Just a thought: ONLY use stainless steel strainer of good plastic. Otherwise, the kefir will have an unwanted chemical reaction. We are making kefir, too–milk and water varieties. Just a thought–use only stainless steel or quality plastic stainer to avoid unwanted chemical reactions. It won’t work with other milk besides animal milk. Just wondering what your schedule is with making your milk kefir? I have my grains making 4 cups at 24 hrs now, but that is a lot of kefir for me to make every day.